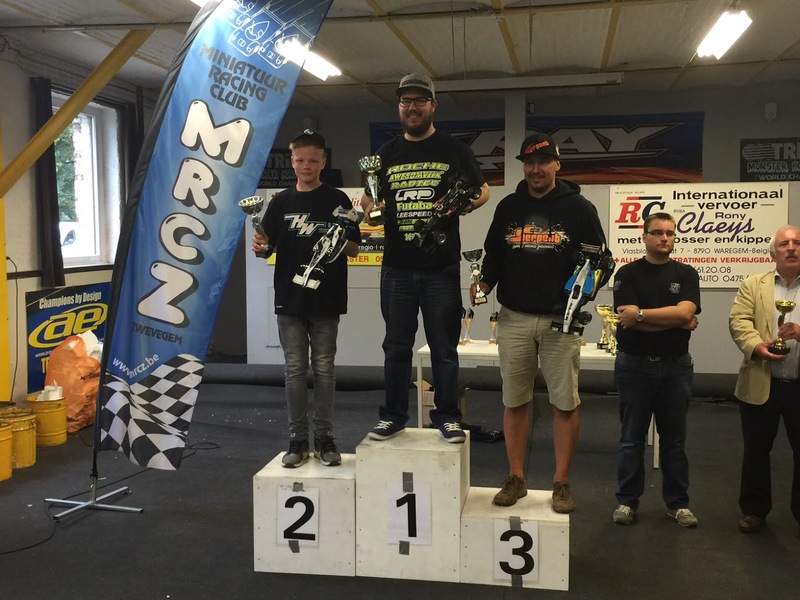 The 6th and last round of the Belgian nationals was held at the newly resurfaced track at MRCZ in Zwevegem. It is a temporary track based on a parking lot which is very technical and challenging. Florian was participating in the TC Stock class (10.5 0 degree timing with the Muchmore Fleta ESC) and F1 (0 boost and 21.5 open motors). On the Saturday, Florian Joos had really good pace with his TRF419X. His fastest lap-time on used tyres was 14.4 secs whereas the nearest competitor was at 14.6 secs. The small technical track really seemed to fit the TRF419X and Florian’s driving style. We experimented a bit with additive and settled for the blue Mighty Gripper. As the base setup was almost the same as the previous race, we experimented with different length of front driveshafts. Florian felt that the 44mm driveshafts gave a bit more steering then the 46mm driveshafts so we settled with those. On Sunday morning, the track was still wet, so we used the raincar (A TA07Pro) for the first qualifier. Florian ended in 3rd position. 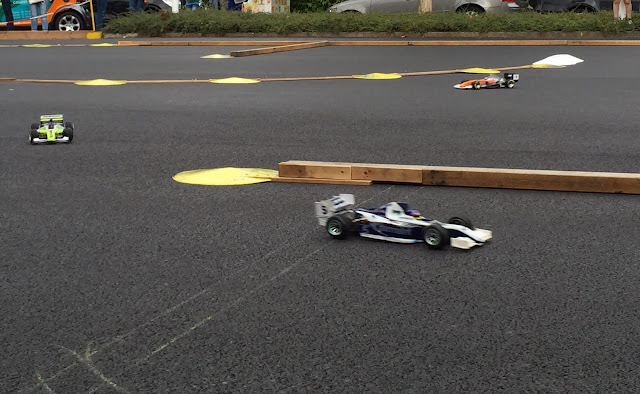 The track was almost dry for the second qualifier, so we used the TRF419X but with new Volante tyres. 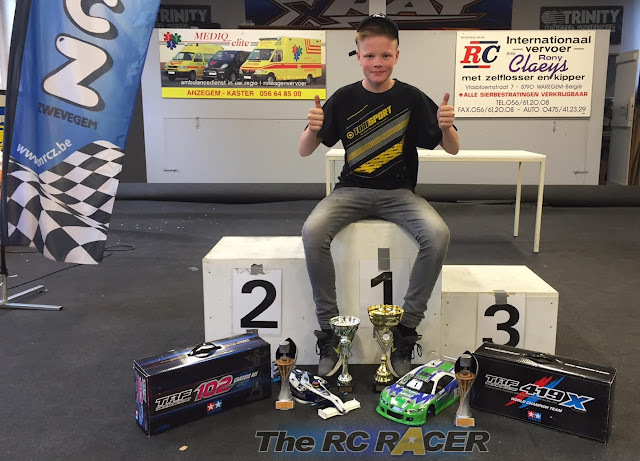 He set the TQ with almost 6 second in front of local driver and newly crowned Belgian Champ Rico Claeys with his ARC. 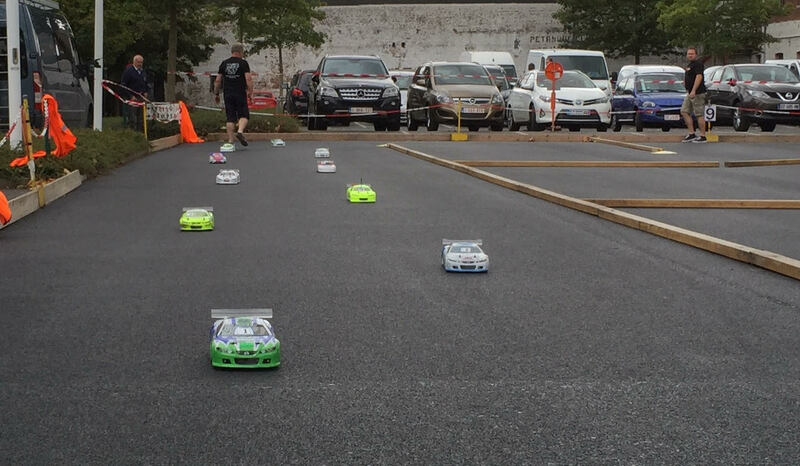 As the third qualifier was completely dry, it would be decisive for the TQ. Florian set off in first position and maintained his lead throughout the qualifier. In the end, he had a 7 second lead over the 2nd placed guy, Stefaan Rommens the vice champion stock of 2016. Because his car was good, and the grip levels of the track were still improving, we decided to leave the setup unchanged. Florian was challenged for the lead in the 3 finals, but he never made a mistake and took 3 convincing victories, while improving his final result from 20 laps in 5:13 down to 20 laps in 5:10 minutes in the last final. The overall champion was Rico Claeys with his ARC. Stefaan Rommens was vice-champion in front of Florian Joos. In F1, Belgian top drivers Ollie Buyltinck (Roche) and Steve Deblaere (Serpent) battled it out during the entire championship. The winner of the last race would decide the new champion. 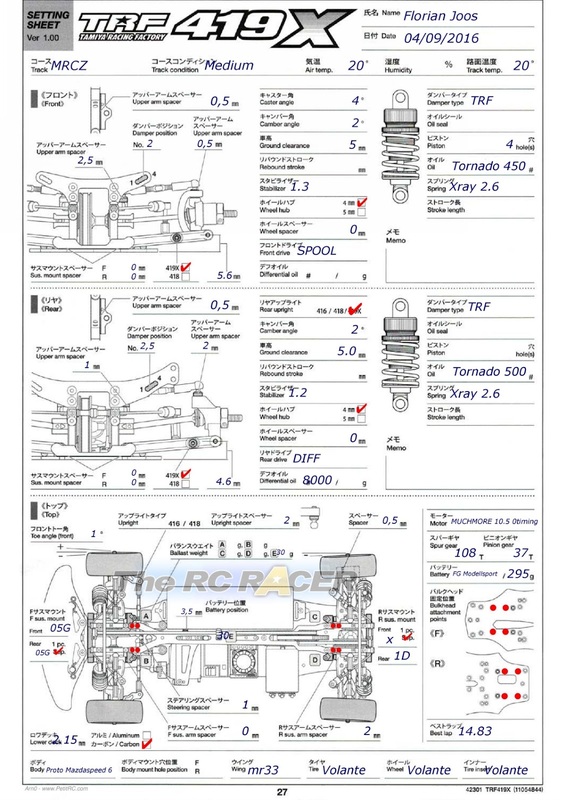 Florian raced an MD Racing F14 in the beginning of the season and used a TRF102 for the last few races. The TRF102 is a very underrated car, but it is quite easy to drive and quite fast. Because we dedicate most of our time on the TRF419X, we haven’t got a lot of time to concentrate on it’s setup. The setup is mainly stock. The only thing we changed is the front camber plate (we run 2.5 degrees negative) and the middle spring (a red TRF spring). Ollie took the race and championship. 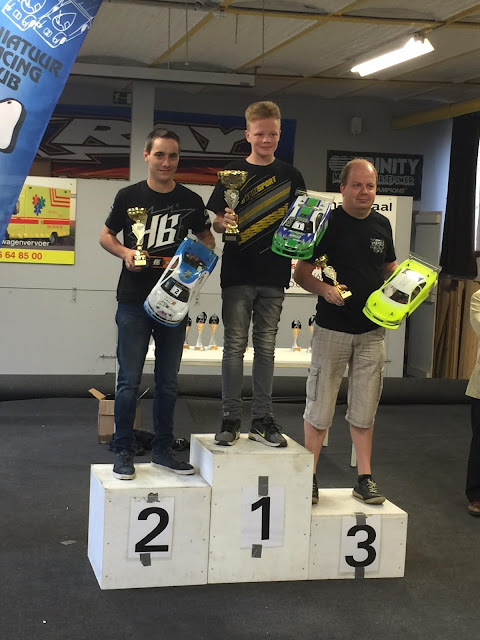 Florian Joos took his Tamiya TRF102 to the second spot in the race and finished 3rd in the championship behind Steve’s Serpent. Steve unfortunately suffered from a motor problem during the last A main. The TRF102 is a bit of an underrated car amongst the F1 competitors out there. It is a very good car on low to medium grip tracks. 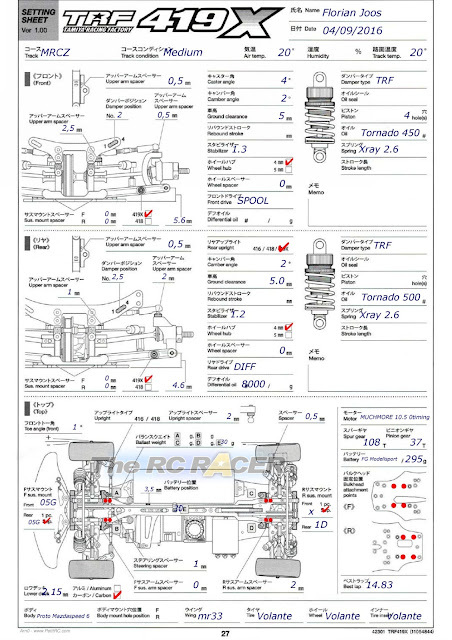 The car reacts good to setup changes and is very easy to drive, despite having a carbon rear axle. And off course the RC racer. Thanks to some of the nice products, like the G blocks, Florian gained a lot of trust in his car, which helped him to become a better driver.